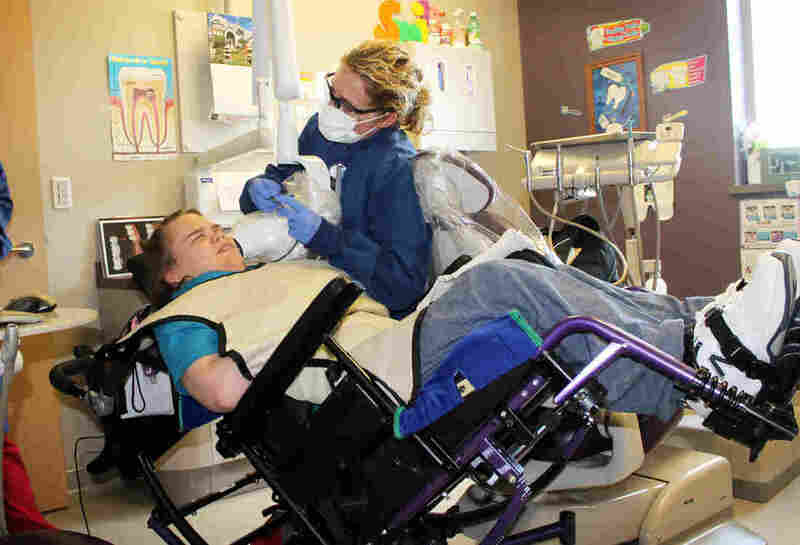 For People With Disabilities, Getting Dental Care Can Be Difficult : Shots - Health News People with serious disabilities and their caregivers often struggle to find dentists who have the ability and desire to take care of their teeth. Cost is another issue. Beth Rown (right), a dental hygenist who cares for patients with special needs, cleans Lindsay Klecker's teeth. 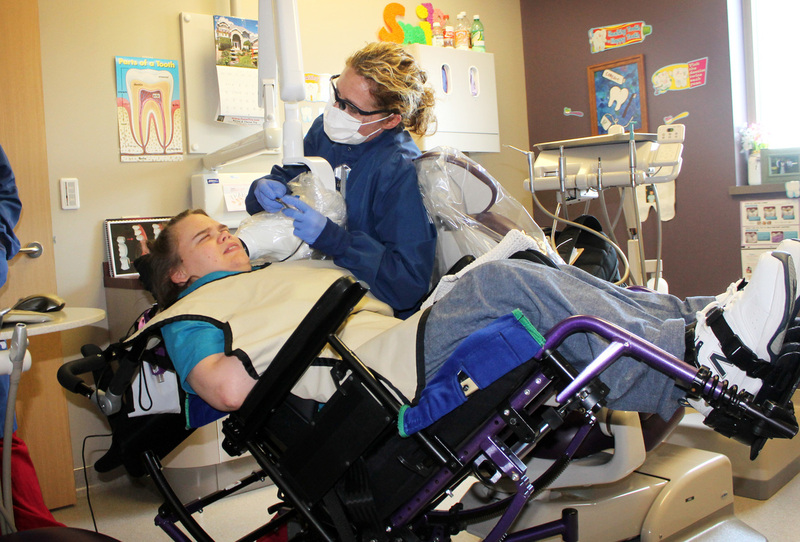 At the Marshfield Clinic dental center in Chippewa Falls, Wis., hygienist Karen Eslinger is getting her room ready. It's all quite routine — covering the chair's headrest with plastic, opening instruments, wiping down trays. But then she starts getting creative. "My next patient is pretty tiny and frail, so I like to go to oral surgery and get a heated blanket. I wrap her up, and I think it soothes her," Eslinger says. The patient is 16-year-old Kathy Falk. She has Rett syndrome, which is a genetic disorder with a constellation of symptoms that look like cerebral palsy, Parkinson's, anxiety and autism all wrapped up together. She uses a wheelchair, can't speak and would find it difficult holding her mouth open for long stretches. Kathy's parents lift her from her wheelchair into the dental chair. Eslinger swaddles her in the warmed blanket and fits her with tiger-striped sunglasses to block the glaring light. She narrates the entire cleaning, telling Kathy everything she's about to do, interspersed with words of encouragement. "She's challenging to get the toothbrush in here and we can only ask so much, you know; whatever she tolerates," Eslinger says as she's bent over Kathy with an electric toothbrush. "You're doing the best you can." For someone with severe disabilities like Kathy, Eslinger and this clinic are quite a find. They welcome patients with all kinds of physical and behavioral disabilities. People with disabilities are often insured through Medicaid, the federal health care program for the poor and disabled. The program doesn't always pay for dental care, and when it does, those payments often fall short of the costs. That means it can be hard to find a dentist willing and able to do the work. Dentists and hygienists at the Marshfield Clinic take people with Medicaid and people without any insurance. They specialize in caring for people with disabilities who need extra help to get through a checkup and cleaning. Some patients with autism may be afraid of lights, sounds or touch. Some with physical disabilities may be unable to hold their head in place. "I have a patient who comes in, and before she gets in the chair we read some books, and then she gets a little calmer and stops crying and we can do a little more of the cleaning," Eslinger says. The patient is in her 30s. A patient with Down syndrome was so frightened that Eslinger started off cleaning his teeth in the lobby. Each appointment moved closer to the treatment room, until finally she persuaded him to get into the chair. The work is also quite physical, says Beth Rowan, another hygienist at the clinic who cares for special needs patients. She's down the hall from Eslinger, cleaning the teeth of Lindsay Klecker, a 31-year-old woman with cerebral palsy and a seizure disorder. Lindsay is blind and uses a wheelchair. Her mother says she functions at the level of a toddler. Rowan leans over Lindsay, working to floss her teeth while her mother stands at her head, singing to her throughout the cleaning. Sandra Klecker sings to her daughter Lindsay to help her stay calm through the cleaning. "It's hard on your body; they're strong," Rowan says. "They're pulling and tugging, their head is strong, their lips are strong, their tongue is strong." For invasive procedures like fillings or root canals, the dentists at the Marshfield Clinic go across the street to St. Joseph's Hospital, where patients can be treated in an operating room under full anesthesia. "There's a certain percentage of the population that absolutely requires having anesthesia for their dental care to be safe," says John Morgan, a professor in the division of special care at Tufts University School of Dental Medicine. 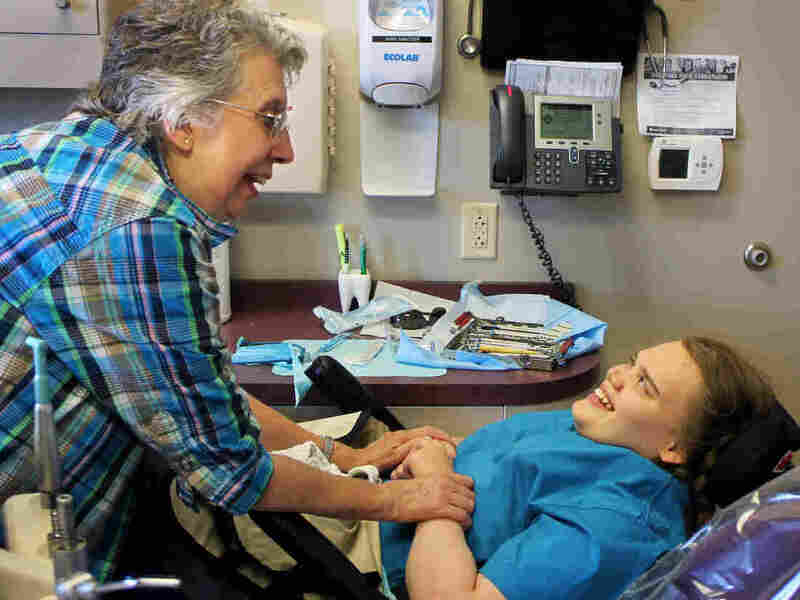 Tufts runs a chain of clinics across Massachusetts that cares for people with disabilities. Morgan is lead author of a 2012 study published in the Journal of the American Dental Association that shows that people with disabilities have worse oral health than the general population. "Access to dental care is one part of the issue, but there's also the issue of what happens at home; what can be done to help improve maintenance of oral health in the home environment," Morgan says. Kathy's mother, Arla Falk, says they tried several dentists before finding the clinic in Chippewa Falls. It's 45 minutes from their home, and they come four times a year. "To have a dentist who would be willing to take medical assistance is a challenge," she says. "We've been to several with her. One of them didn't even want to take her on or keep her as a patient." Three of the Marshfield clinics specialize in serving people with disabilities, and they serve more than 1,700 patients with disabilities a year. "We do have patients that come as far as three, four hours away for a cleaning appointment or for their initial appointment," Rowan, the hygienist, says. "Then they'll have their one to two hours of care and they'll have to drive back, because there isn't anything in their surrounding area." Two years ago, the only clinic in Madison, Wisconsin's capital, that provided dental care under anesthesia shut down because the hospital, Meriter UnityPoint Health, said it was losing more than $600,000 annually on providing dental care. It reopened this month under an agreement with two other hospitals in the city to share costs. While the clinic was closed, Meriter officials referred the patients to the University of Minnesota, four hours away. Jeffrey Karp, a professor at the University of Minnesota School of Dentistry who cares for children with disabilities, says he's not surprised. "We do receive patients who come to us from Wisconsin; also from the Dakotas and parts of Iowa as well," Karp says. "There are not a lot of resources and obviously, you do need to travel larger distances to find those resources." Karp has a grant to identify hospitals, clinics and dentists across the country that care for people with disabilities. The goal is to create networks of providers who have a commitment to providing dental care to people with disabilities despite the cost. Greg Nycz, executive director of the dental clinics in the Marshfield Clinic network, says they get most of their costs reimbursed by Medicaid through a special provision that allows clinics that cater only to the poor to get bigger reimbursements than regular dentists. But St. Joseph's Hospital and two others that Marshfield works with don't benefit from that. "Because we only have poor patients and patients on public assistance, this is a sacrifice for these hospitals," Nycz says. He says he's angry that large for-profit hospitals often won't make the same commitment. Back at the clinic in Chippewa Falls, Kathy Falk has had enough. She's becoming agitated and gurgles a bit. Eslinger finishes up. "We are all done with the cleaning," Eslinger says. "Ah, we got toothpaste everywhere, didn't we?" Down the hall, Rowan compliments Lindsay Klecker's mother, Sandra. "You are doing such a great job caring for her teeth," she says. "She's lucky to have had them as long as she has." An earlier version of this story incorrectly spelled Karen Eslinger's last name as Aslinger.